I grew up in Los Angeles, spent a lot of time growing up in Switzerland, and more recently in Lima, Peru. I have long been aware, then, of the importance of geography to my own life. And yet, as cultural geographer Dennis Cosgrove once put it in the title to a book chapter I read as an undergraduate, geography – and the importance of geography to individual stories – is everywhere. My teaching and research interests lie in the intersections of cultural, political, and urban geography. Increasingly I am interested in broader scale issues to do with the connections between state power, citizenship and law. In broad terms, my work as both a scholar and a teacher is motivated by a deep interest in the relationship between power and culture; in the geography of ideas and symbols on one hand, and that of more grounded issues of authority and privilege on the other. While my research has until now focused on the United States, my interests are significantly broader, and much of my teaching uses examples from around the world. My graduate research focused on how issues of identity, power, and space were articulated in American Indian protest politics in the late-1960s and early-1970s. My MA research dealt with conflicts over ethnic tourism in the American Southwest. Drawing on ideas about colonial representation and space, on the one hand I examined the politics that surrounded tourist representations of the region; representations which rendered the American Southwest as a quaint “land of enchantment,” and thus obscured a far more complex and messy social geography. On the other hand, I examined how American Indian activists sought to challenge such representations – as well as the social relations that underlay them – through public protests. My dissertation research was more clearly focused on issues of national identity and state power. My interest was in the changing geography of contemporary political protest. The time- and space-collapsing qualities of contemporary media and communications technologies greatly enhances the potential visibility of protests. By claiming and reworking important public spaces – and doing so before national and even international audiences – contemporary protesters are able to challenge, and occasionally to change, relations of power. In turn, states have been prompted to respond in sometimes novel ways to these defiant acts of dissent. More recently, this work has fed into a project on broader questions of state power and the geography of contemporary dissent and citizenship. Entitled Boundaries of Dissent: Protest and State Power in the Media Age , the book examines these issues through four case studies: the violent protests at the 1968 Democratic convention; the 1973 occupation of the Wounded Knee reservation; the 1999 rescue and subsequent custody battle over Elián González; and the anti-globalization protests in Seattle and Québec City in 1999 and 2001. It has recently been published by Routledge, and is available online from both Powell’s and Amazon. 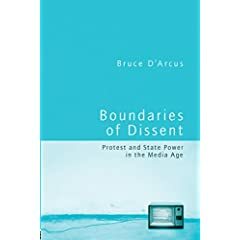 2006, Boundaries of Dissent: Protest and State Power in the Media Age , New York:Routledge. 2004, Dissent, Public Space and the Politics of Citizenship: Riots and the ‘Outside Agitator.’ Space and Polity v8, n3, pp355-370. 2004, Globalization and Protest: Seattle and Beyond. In WorldMinds: Geographical Perspectives on 100 Problems, D. Janelle, B. Warf, K. Hanson eds. Kluwer. 2003, Contested Boundaries: Native Sovereignty and State Power at Wounded Knee, 1973. Political Geography. 2003, Protest, Scale and Publicity: The FBI and the H. Rap Brown Act. Antipode. 2000, The “Eager Gaze of the Tourist” Meets “Our Grandfathers’ Guns”: Producing and Contesting the Land of Enchantment in Gallup, New Mexico. Environment and Planning D: Society and Space, v18, n6, pp693-714. The majority of my teaching experience at the university level has involved courses that approach geography from a global perspective. I regularly teach the introductory Global Forces/Local Diversity course at Miami. I have also taught a variety of courses in urban geography, including Advanced Urban Geography, Global Cities, World Economy, and Power and Public Space, as well as the introductory graduate Geographic Thought seminar. You can contact me either by , or by phone at 513-529-1521. My office hours are T/TR 3-4, or by appointment.